Are you more of a Loaded Lasagna Dip or a Cheesy Funfetti Stew? 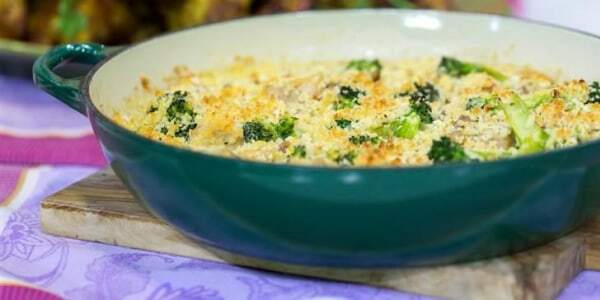 When we imagine popular foods from the Midwest, hearty casseroles certainly come to mind. They're the perfect dish for a big party, the provide plenty of leftovers and they're totally comforting. But with so many varieties out there, how is one to choose a signature casserole dish? Well, one man from America's heartland decided to take the guesswork out of casserole making with a handy (and hilarious) potluck dish name generator. On Monday, Scott Hines, known as @actioncookbook on Twitter, created a casserole-themed meme and pretty much every available combination sounds absolutely delicious. The handy guide works like many a name generator that has come before it: First, users select a word that corresponds to their birth month, then another word is chosen based on the first number of your address and, finally, the third word is represented by the last number of your birthdate. There are all sorts of possible combinations, from cheesy to beefy, sweet or spicy — but most variables actually end up sounding like a legitimate dish that would be served at any potluck party in the Midwest. For example, who wouldn't want to try a "Sinful Brownie Skillet" or a "Loaded Pizza Pinwheel"? Social media is already having a lot of fun playing around with the concept. What’s the best reheat temp for Beefy Oreo Loaf leftovers? A Mexican Pizza...Ball? Is that a burrito that’s been poorly rolled? I guess that's just melted Cookies n' Cream. Hines, the brains behind the graphic, told TODAY Food over email that the idea for the generator actually came about after attending a recent potluck party for work. "I came home from work and remarked to my wife that I forget how Midwestern we can be until I'm eating taco soup out of a slow cooker," Hines reflected. His wife then asked, "Taco soup? Don't you mean chili?" He corrected her: "No, chili's too spicy. This is just ground beef soup that you put cheese in." That exchange gave the couple the idea for the casserole generator. "We're both Midwesterners, [I'm] from Ohio, her from Indiana, and it was easy to channel all the recipe permutations that we see posted on Facebook, many of them with interchangeable parts/methods/forms," Hines said. He added that about a third of the casseroles he's seen generated by the chart are dishes he's actually tried! As for Hines, his personal dish is an "Italian Taco Skillet," while his wife Melissa's is a "Weeknight Cheeseburger Ball." We'd be thrilled to try either dish!